Some tech we saw was borderline magical. Opté’s spot-erasing wand had us doing double takes as it erased age spots and discoloration in real time before our eyes. Likewise, L’Oreal’s My Skin Track pH impressed with its flexible, but chic sensor prototype that can measure your skin’s pH levels based on your sweat. Olay even convinced us that maybe daily moisturizing regimens should be a thing with a handy AR app that predicts how you’ll look in the future based on your skin care habits. But where there is good tech, there is also bad tech. Like the Clartici. It’s a scanner that supposedly measures the health of multiple layers of skin with a complicated metaphor. In the app, your skin health is visualized as layers of soil and described in unhelpful terms. Like, your left cheek area’s “soil color” might be “medium as ginger.” Ultimately, it’s supposed to tell you how best to moisturize with its proprietary lotions and costs a whopping $2,500 retail. (Somehow, it was on sale at CES for just $200. Still.) 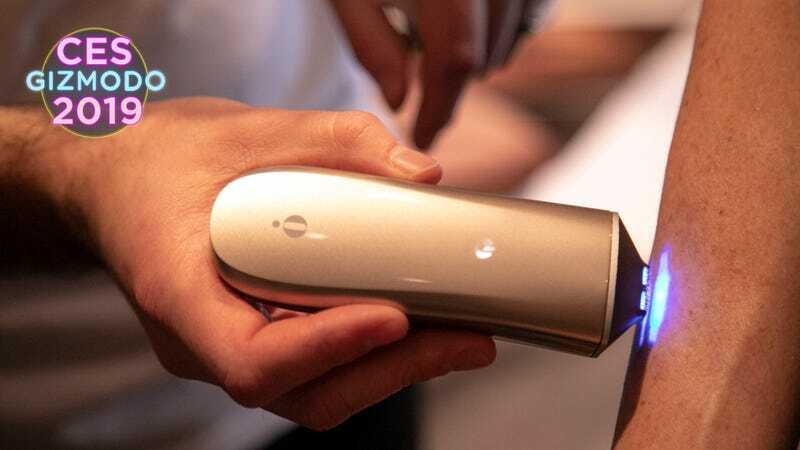 And while we were fans of Olay’s Future You Simulator and Keurig-esque Moments pod, its FaceNavi Wand sort of fell flat as a massager with a tacked-on AR component. There were also plenty of dubious light therapy and sonic massage wands. These devices are meant to cure everything from acne, blackheads, wrinkles, and reduce under-eye puffiness, but translate to little more than either giving your face a sonic massage or waving multi-colored LED lights in front of your face.